Green Bay, Wis. – The Commercial divisions of H.J. Martin and Son this month are wrapping up work on educational facilities across Wisconsin as students prepare to head back to the classroom. More than 50 school projects either have been finished or are nearing completion by the specialty contractor. The projects range from more than 30 local ones in Northeast Wisconsin, to several in western Wisconsin (Arcadia, Black River Falls, Cashton, Menomonie), in the northern part of the state (Irma, Phillips) and on the outer edges of Milwaukee (Hartford, Hartland, Wales). H.J. Martin also has more than a dozen post-secondary facility projects in its 2015 educational portfolio, including four at University of Wisconsin member institutions. Work has been performed by four different H.J. Martin Commercial divisions: Glass & Glazing, Walls & Ceilings, Flooring and Doors & Hardware. Many of the educational projects entail multiple divisions, utilizing the cross-training of the company’s installation team. “Educational projects generally require a tight timeline for completion, including some night work,” says CEO Edward Martin. “Our flexible work force allows us to meet any challenge, whether on a school expansion or a remodeling job. We believe that educational facilities have become a recognized strength of our company. While many of these projects have been finished, several are scheduled for completion over the next one to two weeks – before the first students arrive for the 2015-16 school year. 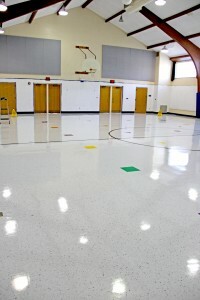 Gym of Cormier School & Early Learning Center in Green Bay, Wis.
See a sampling of our past work in educational facilities and other industries HERE.